Brookhaven National Laboratory is preparing for a new wave of discoveries. PHENIX is in its final runs, but superPHENIX waits in the wings. Upgrading its PHENIX detector and Relativistic Heavy Ion Collider marks the beginning of an exciting new chapter for BNL and high-energy physics. By upgrading its PHENIX detector and Relativistic Heavy Ion Collider (RHIC), the US Department of Energy’s Brookhaven National Laboratory (BNL) in Upton, New York, is preparing for a new wave of discoveries in high-energy physics. Together, these redesigns herald an exciting future at BNL. The PHENIX (Pioneering High Energy Nuclear Interaction eXperiment) detector recorded its first relativistic heavy ion collision in 2000 and has been a pioneering experimentation facility ever since. Now, the collaboration is gearing up for one final run in 2016, and the next version of PHENIX — SuperPHENIX (sPHENIX) — is in the planning stages. sPHENIX will reuse much of the existing PHENIX infrastructure, but move from detecting single particles to detecting jets. This modification will enable sPHENIX to address questions about the nature of strongly coupled Quark-Gluon Plasma (QGP), and how and why it behaves as a perfect fluid — questions that can only be addressed by a detector that can measure jet production. "Jets are like a spray of particles moving in a very narrow cone. This calls for a different detector design,” says Purschke. At the core of the new detector is a super-conducting magnet from SLAC National Accelerator Laboratory. Just shy of three meters in diameter (280 cm) and about four meters long, the cylinder will also be equipped with detectors such as calorimeters. “Collisions will happen in the center of the cylinder, and the particles will come out every which way, even to the edges of the cylinder,” Purschke says. “Particles will no longer be coming straight into the detector modules, but will hit at significant angles.” Since the detector will respond differently to particles coming in at an angle, Purscke's OSG simulations will help determine that particular design aspect. 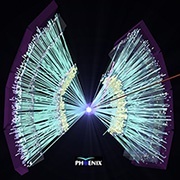 An animation showing particles traveling through some PHENIX detectors. Courtesy BNL. Meanwhile, the RHIC will be undergoing a massive change. By adding an electron ring and other accelerator components to the existing RHIC at Brookhaven, researchers hope to create a new high-energy electron-ion collider (EIC) to unravel the mystery behind what makes matter cohere. 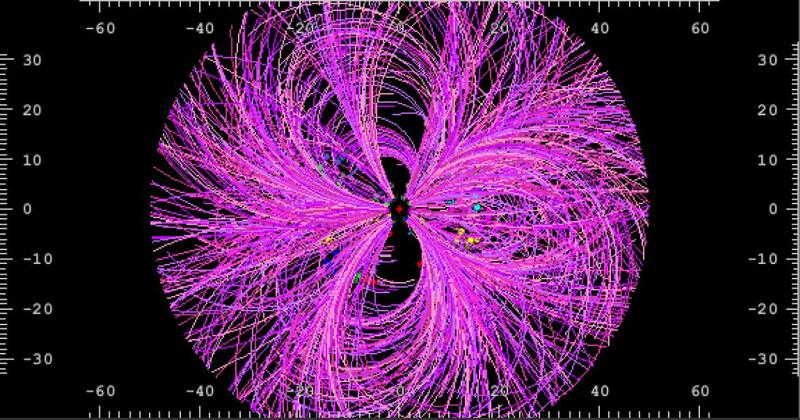 This could ultimately shed light on the origin and structure of the core of the atom. The EIC would be unique among such facilities worldwide, adding a 5- to 10-billion-electron-volt (GeV) electron ring inside the existing RHIC tunnel. Quantum chromodynamics (QCD), a theory of strong interactions, has led nuclear scientists to develop new tools that reveal the interactions of quarks and gluons inside protons and neutrons. The EIC stands to enhance these tools. While on an exchange program at Brookhaven last year, Liang Zheng ran large simulations on the OSG to try to predict what will happen in experiments and to modify the detector setup accordingly. Zheng and his colleagues used Sartre, software developed at Brookhaven to study electron-ion collisions using random sampling techniques based on numerical calculations. The benefits of high-energy nuclear and particle physics research are not always apparent to the general public. Physics research asks questions about the undiscovered principles of nature and can take years of patience. But basic research can result in unexpected discoveries and cross-pollinate other research areas in unpredictable ways.